Only Melania Trump could know why she liked a tweet pondering the mystery of how she snagged a green card. The First Lady’s personal Twitter account, not the government-issued platform reserved for the President’s spouse, liked a video Sunday night from a progressive talk show titled, “How Exactly Did Melania Trump Get an "Einstein Visa?" Trump liked the tweet from the White House just before 10 p.m. and it remained on her feed as of early Monday. 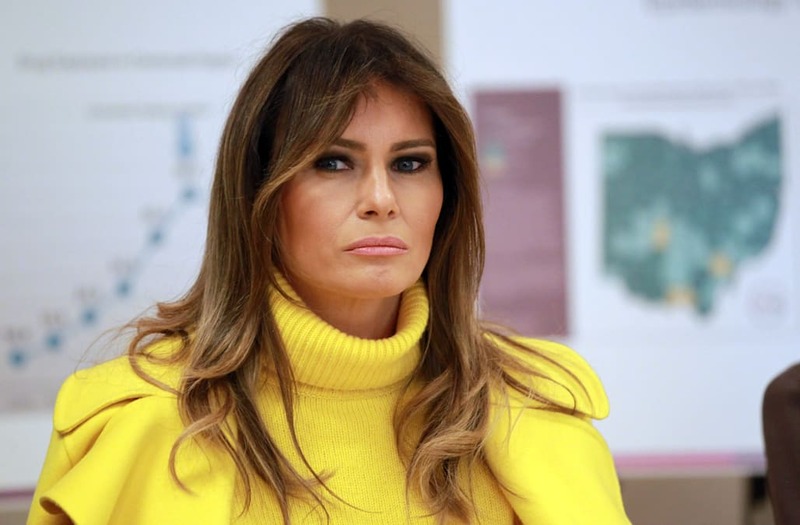 Her acceptance helped Trump bring her parents, Viktor and Amalija Knavs to the U.S.
Melania Trump’s rogue Twitter made headlines in May 2017 after she appeared to like a left-wing blogger’s social media post suggesting her marriage to Donald Trump was distant. The like vanished from Trump’s Twitter feed after an hour and a half. Great day with military families at @JBABdc as we sorted toys. Thank you Toys for Tots for all that you do for kids across the country. Merry #Christmas! Today we honor Pearl Harbor Heroes. 12/7/1941 Thank you to all military for your courage and sacrifice! Thank you to the talented performers from Vivid Ballet Company who helped us unveil this year’s decorations at the @whitehouse. Congratulations to Drumstick on the pardon from @Potus! We loved having you & Wishbone at the @Whitehouse. Honored today to donate my inaugural couture piece to the @amhistorymuseum! Enjoyed hosting Sophie Trudeau at the @WhiteHouse today. Thank you neighbors to our north, for the visit. So enjoyed hosting yesterday's #UNGA luncheon. Thank you all who attended & will help support my efforts on behalf of children. Thank you @GovAbbott @fema @uscoastguard @RedCross & local officials for the briefing today on #HurricaneHarvey. We are with you #Texas! Welcome to the @WhiteHouse Prime Minister Modi!
. @Potus & I are heading home after a very successful first International trip. Thank you to all of the host nations for your hospitality! Thank you to Queen Fabiola University Hospital for allowing me to meet w your amazing patients! Enjoyed creating paper flowers with them & getting a tour. Today's visit with His Holiness Pope Francis @Pontifex is one I'll never forget. I was humbled by the honor. Blessings to all. Enjoyed talking to the incredible women working hard at this @GE_Saudi service center. Great strides being made towards the empowerment of women. Wonderful opening ceremony today for the new Healing Garden at @childrenshealth. It will play vital role in recovery of extraordinary patients. .POTUS & I were thrilled to stop by the Women's Empowerment Panel held at the @WhiteHouse today! Wonderful visit from the President of the People's Republic of #China, Xi Jinping & Madame Peng Liyuan! Looking forward to hosting the annual Easter Egg Roll at the @WhiteHouse on Monday! Our family truly enjoyed hosting today's #EasterEggRoll. Thank you to all of the volunteers who worked hard to make it a success. I am deeply honored to serve this wonderful country as First Lady!